Using the words “modern” and “vintage” in the same sentence doesn’t seem to make sense, but entrepreneur and professional blogger Nicole Balch was going for that look in her 100-year-old Chicago home. After four years of living in her home, Nicole and her husband were looking to modify their grandeur home with modern touches to accommodate their growing family. The Balch's have a 2-year-old daughter and a newborn son. So Nicole tackled the task of remodeling their half-bath and re-finishing the basement including the installation of a laundry room. “I wasn’t really going for a ‘period specific’ look, but I wanted to find items that wouldn’t be out of place (in a century-old home),” Nicole explained. That’s when she reached out to Vintage Tub & Bath to complete the look she was going for. After researching links from other blogs, she was led to Vintage Tub. She contacted us with her ideas for her remodeling plans back in late fall 2010, and the ball started to roll. Working with the Vintage Tub design team, Nicole got the bathroom of her dreams. The half-bath was a little challenging because of its size—a cozy 5’x 6’x 6’—a typical size for a small room in that time period. 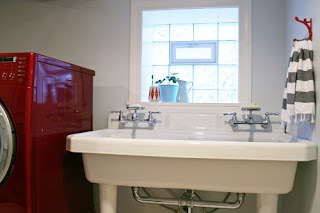 With the space limitations, Nicole found a toilet and pedestal sink from Vintage Tub that fit the “vintage” bill and was also practical. She polished the look of the antique-style sink with a faucet set that was perfect for the powder room. Then came the laundry room. “Old-fashioned sinks completely charm me,” gushed Nicole. She chose a Kohler Harborview large utility sink with a wall mounted kitchen bridge faucet with metal lever handles. “The laundry tub is A-MAZING!” exclaimed an ecstatic Nicole. The artist is already planning craft projects to do with her kids, like silk screening and other fun, messy things toddlers love to do. With this sink, clean up will be a snap! Nicole chronicled the progress of her home renovations on her own blog which is an interior design blog geared for anyone, especially moms. Luckily, Vintage Tub was able to dodge the blizzards and snow storms throughout the winter season to deliver the bathroom and laundry room products with no delay. Some of the home's makeover was done by the Balch's, but a very pregnant Nicole let the installation of the sinks and toilet to a professional contractor. So with the birth of her son August in February, remodeling projects kind of took a back seat. Now that it's March, a semi-sleepless Nicole is ready to get the projects completely finished. She unveiled part of her renovated half-bath on her blog. The laundry room is in what Nicole calls the 1.5 version…functional but not quite finished. Painting the room wall a robin’s-egg blue will add that touch of spring and will just about complete the room. “You guys have been great to work with!” Nicole chirped, speaking of the Vintage Tub & Bath team. With their help, Nicole successfully updated or is in the finishing stages to her vintage Chicago home while maintaining the classic look and antique charm she wanted to keep.